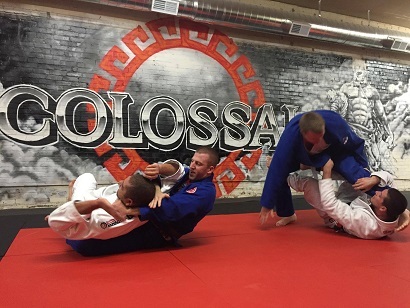 Colossal Fight Company offers jiu jitsu from highly trained instructors, who are all active competitors. 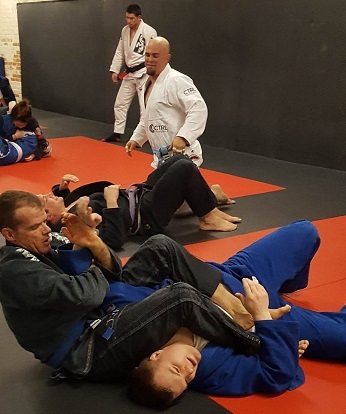 We are the only school in the region that provides safe, effective training from instructors who publicly test their jiu jitsu against other fully resisting opponents. We highly encourage you to give us a call at (208) 840-0766 or send us an email to schedule your free classes! Jiu jitsu (sometimes called Brazilian Jiu Jitsu or Gracie Jiu Jitsu) is a martial art that focuses primarily on self-defense. It was developed and refined over the last few centuries to allow a smaller, weaker person to defend themselves from an aggressor by using optimal technique and leverage. The underlying premise of jiu jitsu is to secure a dominant position, from which your opponent is unlikely to hurt you. Once you have established that control, jiu jitsu gives you the ability to control or submit your opponent using a wide variety of pins and holds. At its core, jiu jitsu provides highly effective self-defense, and ensure that it works through practical training. Jiu jitsu's lineage can be traced back as far as fuedal Japan, making it a relatively young art compared to wrestling, boxing, or muay thai. Jiu jitsu literally translates to "the gentle art", and was practiced in an early form by the samurai. The samurai used jiu jitsu when they did not have access to their weapons in order to subdue or kill opponents. Due to the fact that enemy warriors wore armor, jiu jitsu was required to attack their joints or necks. Utilizing these techniques, it became possible for an unarmed person to have a fighting chance against an armed opponent. After centuries of use and refinement, the most effective techniques in jiu jitsu that could be practiced safely were identified. Kano Jigoro incorporated these techniques into judo, with the intent of allowing practitioners to train at full force. This shift in training methodologies allowed martial artists to test their skill against fully resisting opponents, and quickly elevated the effectiveness of hand to hand combat. As judo spread around the world, Mitsuo Maeda traveled to Brazil to teach. There, Maeda encountered the now-legendary Gracie family, who helped him become established in exchange for training. Maeda taught jiu jitsu and judo to Carlos Gracie, who went on to teach his brothers: Helio, Jorge, Gastao, and Oswaldo. 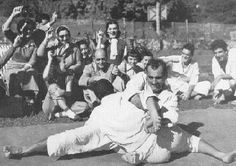 The Gracie family worked tirelessly to further refine the jiu jitsu they had been shown in order to maximize the efficiency of each technique, and to optimize the art for teaching. As they trained, the Gracies tested their jiu jitsu by competing against many legendary martial artists. Present: Today, jiu jitsu is more popular than ever. Due to the widespread popularity of mixed martial arts (particularly the UFC), more people than ever are coming to learn the most effective self-defense system ever developed. Due to jiu jitsu's foundation of ensuring that techniques are effective and battle-tested, it is being incorporated into virtually every effective self-defense curriculum. Additionally, law enforcement around the globe has begun incorporating jiu jitsu into their defense and arrest procedures. Because jiu jitsu offers the ability to restrain an opponent without causing lasting harm, it has allowed officers to protect themselves from criminals without permanent injury. You have the ability to join the unbroken line of jiu jitsu that dates back to the samurai. We invite you to join us for training! Whether you want to learn effective self-defense, become a serious athlete, or just stay in shape, jiu jitsu has something for everyone!